I am going to talk about a product which has been an absolute life saver for me. I came off hormonal birth control 3 months ago after being on it for 8 years. Since then, my skin has been terrible and difficult to control - it's dry and acne prone with quite a few patches of eczema. Obviously, you can't really see this in my photos as I wear quite a bit of makeup. For work, though, I don't wear foundation as it is way too heavy for my skin at the moment to wear on an everyday basis. I sought an alternative to foundation which wouldn't be too heavy for my skin. I tried a high-end tinted moisturiser and 2 drug store BB creams. All of them made me look orange despite the high-end one claiming to be for fair skin. Then I found my miracle product! I went into the Body Shop to buy a couple of hand sanitisers and I decided to have a look at the makeup and skincare as I always have loved their Chamomile cleanser. This BB cream caught my eye as it contains tea tree, so I thought that it might help to stave off some of the awful breakouts I was having. And, boy did it help! This product is literally amazing. 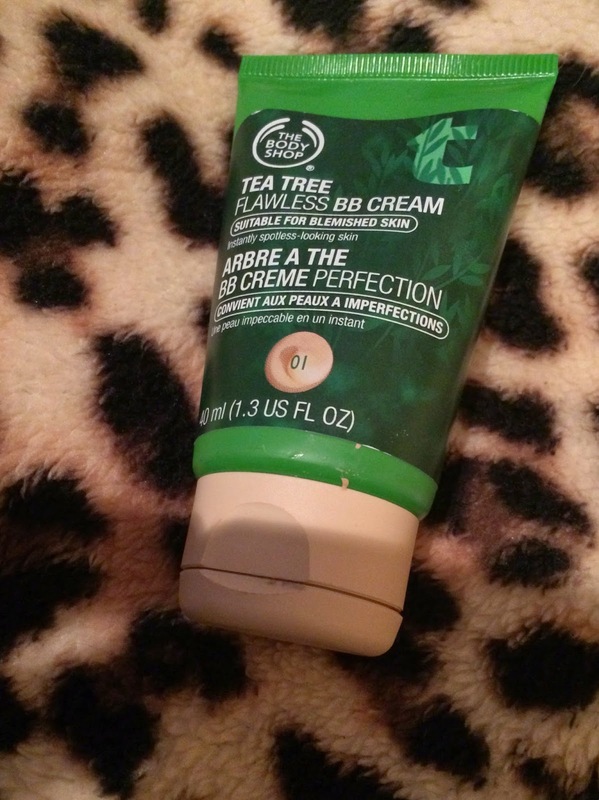 It has the tea tree scent and it makes my skin tingle a little upon application. It's very moisturising but not heavy at all - and it provides me with enough coverage for my blemishes. The product comes in 3 shades and the shade '01 Light' matches my skin perfectly. I would totally recommend this product if you have dry or acne prone skin. If I had discovered this as a teenager it would have been great. I think the price is reasonable considering that the tube will last you a while. This is a great quality product and I thoroughly recommend it to all.